The Petersburg schools have been operating under Memoranda of Understanding (“MOUs”) of the Board of “Education” since at least 2004. The current MOU and associated “Plan” are long on inputs but they fail to measure or demand adequate outputs. As to the purpose of any school (learning! ), there is no plan and no accountability. 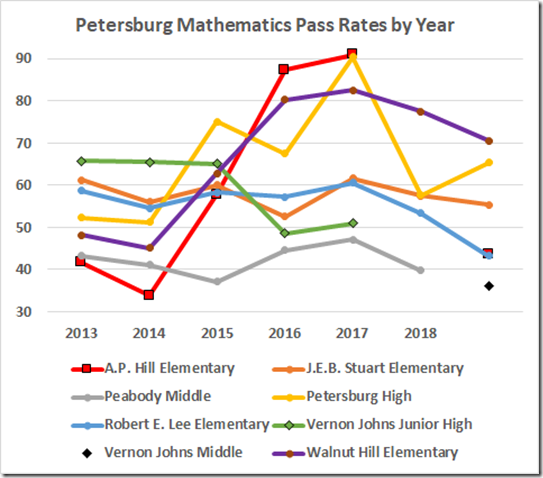 In light of this fecklessness, it cannot be surprising that the fourteen year history of Board of “Education” dealings with Petersburg is a tale of unremitting failure. 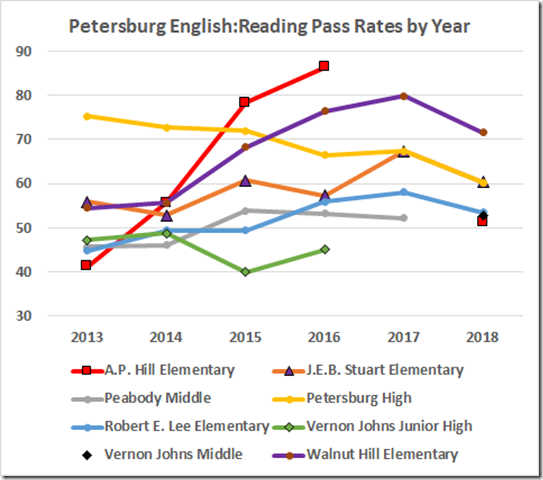 I have asked Petersburg for clarification of the recent SOL data but have received no response. So we’ll have to try to figure things out from the public record. The last year Peabody Middle was open was 2016-17. In 2017-18 we moved the middle school to the building that previously was named Vernon Johns Junior High and we renamed it Vernon Johns Middle. Vernon Johns Junior High’s last year was 2015-16 (I think). During the 2016-17 school year, the Vernon Johns building was empty. The 2017 datum for A.P. Hill is missing because the school was caught cheating that year. 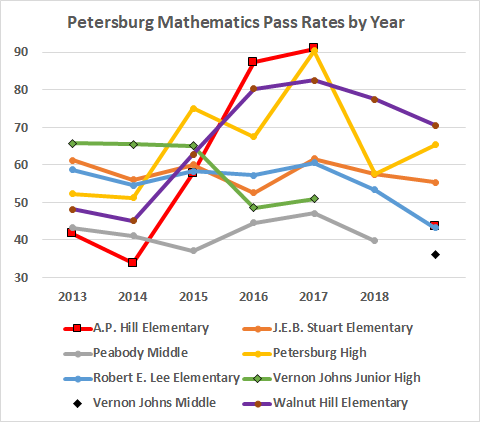 Peabody Middle data are missing for 2018; Vernon Johns Junior data are missing for 2017 and ‘18; Vernon Johns Middle data start in 2018. The current directory of Petersburg schools lists only one middle school, Johns Middle. It looks like Peabody and Johns Junior have been merged into Johns Middle. No telling about the 2017 data for Johns Junior. Here are those data on a graph. Notice the (temporary) benefits of cheating at Hill (the red line). And notice the bottom-of-the-barrel pass rate there once they had to test honestly. And notice that very nearly half of the students tested at Lee, Johns Middle, and Hill failed this year. Except for the high school in 2013, Walnut Hill in 2016 and ‘17, and Hill before it got caught, none of these data meets the 75% benchmark for English accreditation. Even more to the point, there’s no indication here of improvement in these ninth through fourteenth years of state oversight. The high school enjoyed two years above the 70% accreditation benchmark; Walnut Hill managed four but is headed in the wrong direction. All the others were, and are, mired in failure with no sign of improvement. Indeed, more than half of the students tested at Hill, Lee, and Johns Middle flunked the tests. Please visit this page for a discussion of the several reasons that the MOU process is a terrible idea, both as to strategy and tactics. 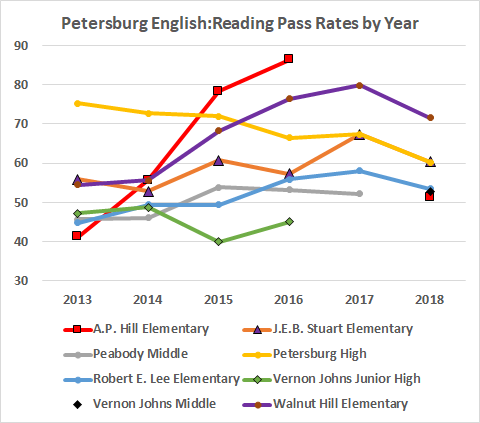 Those concerns aside, the data above demonstrate that the process has been a wordy and persistent failure as to Petersburg. The Board of “Education” can sue to compel compliance with the Standards of Quality. They have not done so. They have instead persisted with this failed process that they know does not work. If it were to sue, the Board would have to tell the judge what Petersburg must do to fix the schools. The Board cannot do this because it does not know (Sept. 21, 2016 video starting at 1:48) how to fix those schools. That is, the Board knows it would be futile to sue (and even more embarrassing than its present failure). So now the Board has brought the same disruptive, expensive, and futile process to Richmond with, in this first year, the inevitable absence of any measurable benefit to the students.